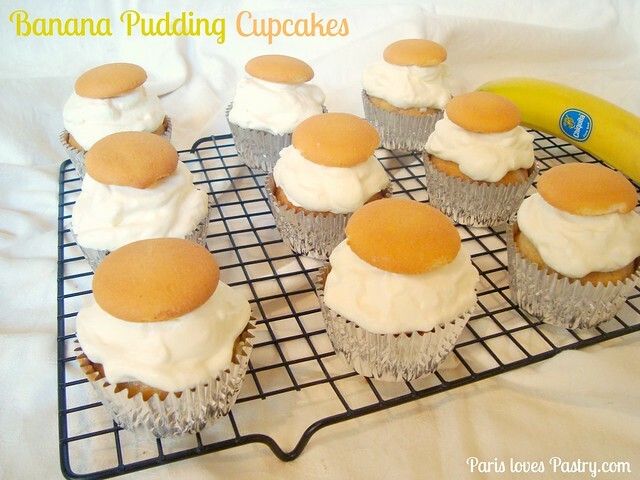 Paris Pastry: Banana Pudding Cupcakes! After baking my way through most of Martha Stewart's online recipes, and almost all of my cookbooks, I'm getting inspired to try out recipes from Pinterest. I came across this image of delectable banana pudding cupcakes and I knew I would make them soon myself. 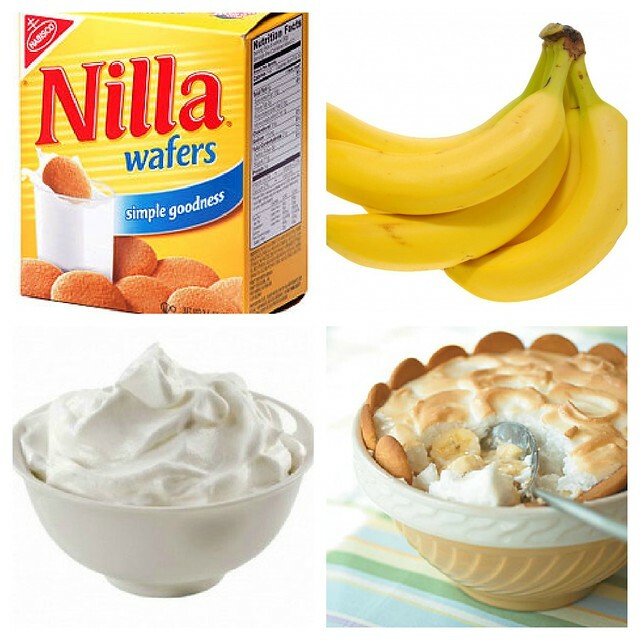 I love banana pudding! My family does not. They think it's some icky, gooey pudding with too many ingredients... I'm obviously not too sophisticated to adore a messy banana pudding. Nilla wafers are a childhood favorite of mine. And I'll use any excuse to incorporate them into my sweets. The banana cake recipe is from old, faithful Magnolia Bakery. I filled the cupcakes with a creamy, store-bought vanilla pudding. Topped them off with whipped cream and a traditional Nilla Wafer cookie. I'm completely in love with them! So much, that I've eaten them for breakfast as well. Yikes! Rating: 5- out of 5. - Preheat the oven to 325 degrees. - In a small bowl, sift together the flour, baking soda, salt and baking powder. Set aside. - In a large bowl, cream the butter until smooth on medium speed. Add the sugar gradually and beat until fluffy, 3 minutes. Add the eggs, one at a time. Add the bananas. Add half od the dry ingredients, mixing until well incorporated, then add the buttermilk and vanilla, and the second half od the dry ingredients, mixing well. - Divide the batter in two 6-inch cake pans, and bake for 40-50 minutes (about 25 minutes for cupcakes). - Whether you want to make your own pastry cream or use a boxed pudding, vanilla or banana flavored, cut a small piece out of each cupcake center and discard the center. Fill a pastry bag with the pudding and pipe into each hole. 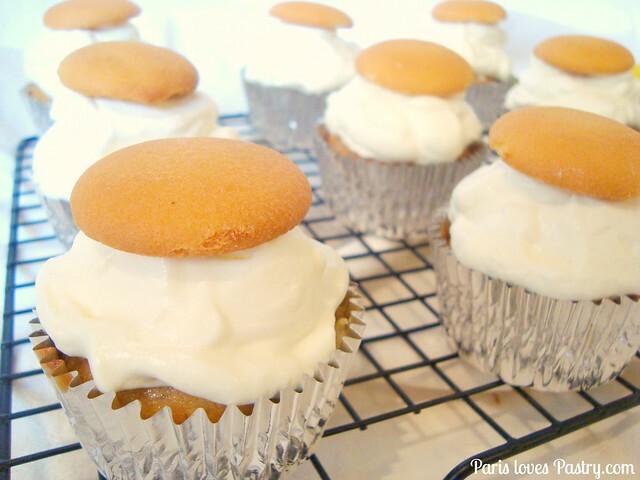 Top the cupcakes with a whipped cream frosting (my recipe here), and finally top with a Nilla Wafer cookie. Enjoy! These are really cute cupcakes!